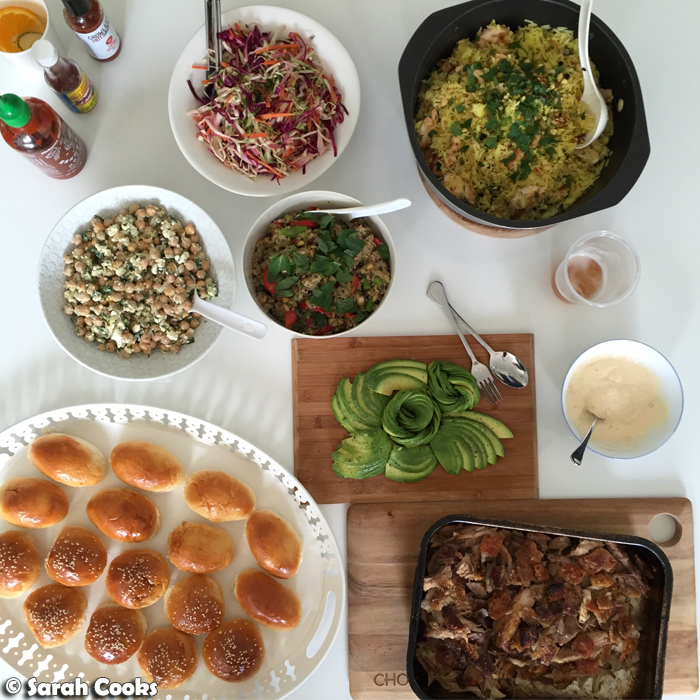 My blog turned 12 years old last week, and I threw a little lunch party to celebrate. I'm terrible at remembering my blogiversary, and have only remembered to do so on my fifth, sixth and eleventh blog birthdays. The years roll around so fast, and suddenly it dawns on me that I've been doing this blog thing for twelve years! My blog is a tween! This year, I didn't want the birthday to slip past unnoticed, so I used it as an excuse to have some friends over to eat lots of delicious food! As you can see, I chose a bunch of dishes that were special to me and my blog. I did a bit of prep the day before - food shopping, making the chickpea salad, baking the meringue layers for the gooey chocolate stack, and making the pastry for the cherry pie, but the majority I did on the morning itself. Let's take a look at the food! 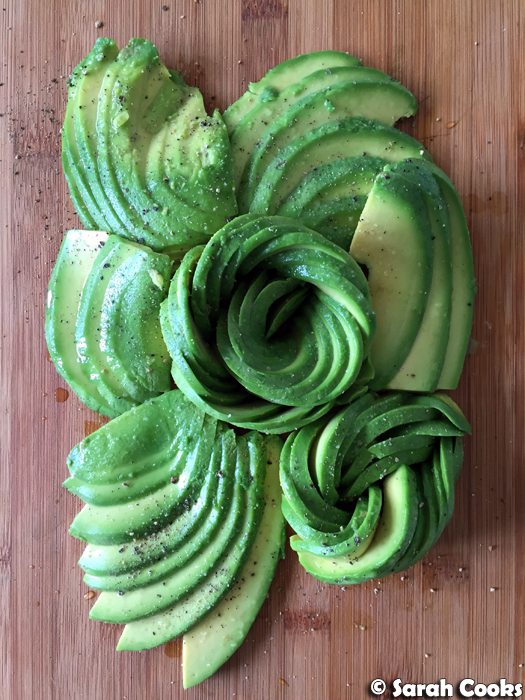 I couldn't not include something avocado based, and I think my avocado slicing skills have improved since my "How to Slice an Avocado" tutorial. We've still got the Barham Avocados subscription, and if you follow my Instagram, you'll see that I'm still all about the sliced avocado on toast. 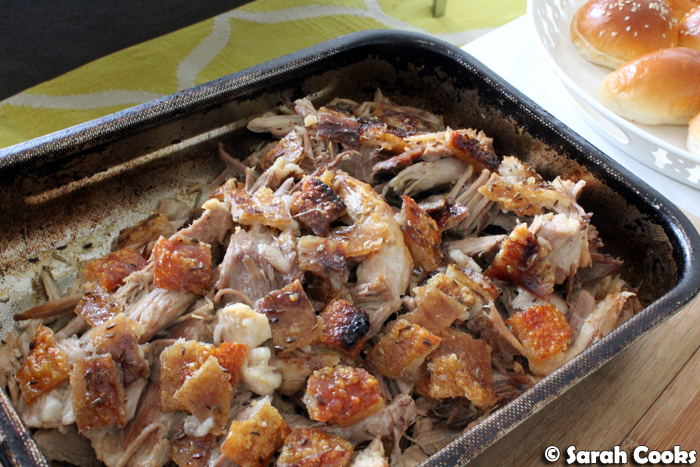 Pork shoulder and crackling! Woohoo! 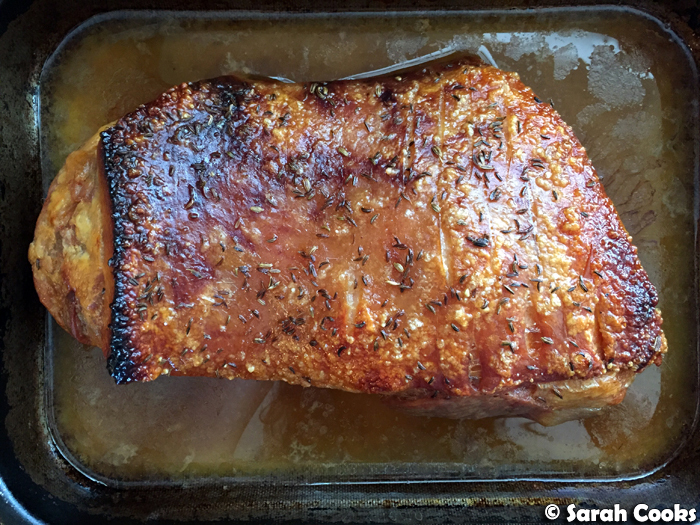 My blogpost: "The Best Roast Pork Shoulder and my Tips for the Perfect Crackling..." is one of my most popular posts, and I relish any opportunity to make delicious pork crackling. And a little video, why not! P.S. Turn the sound on so you can hear the crisp crackle as it shatters. (And also my friend Aditya saying that it looks good, hehe). Because there were a lot of sharing dishes, I decided to cut / shred the pork in small pieces, and served it with soft buns (Breadtop dinner rolls! 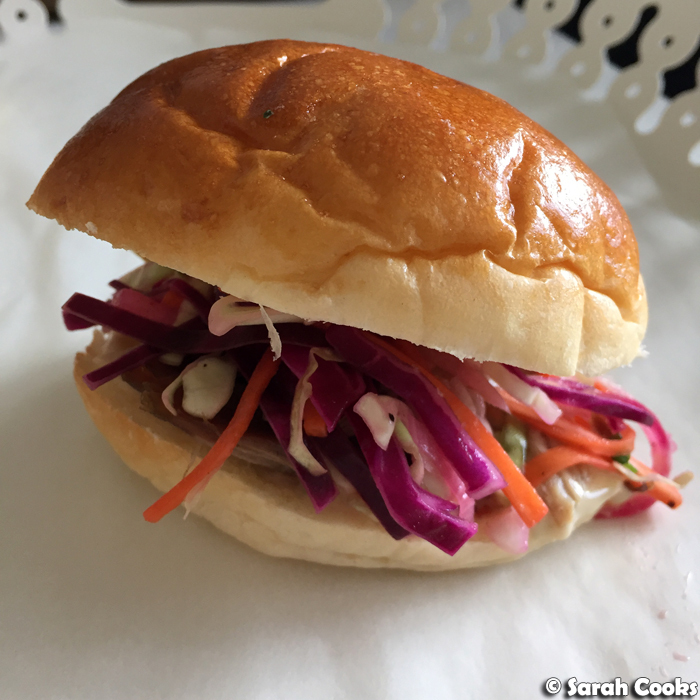 ), habanero mayo, and coleslaw for people to make sliders. 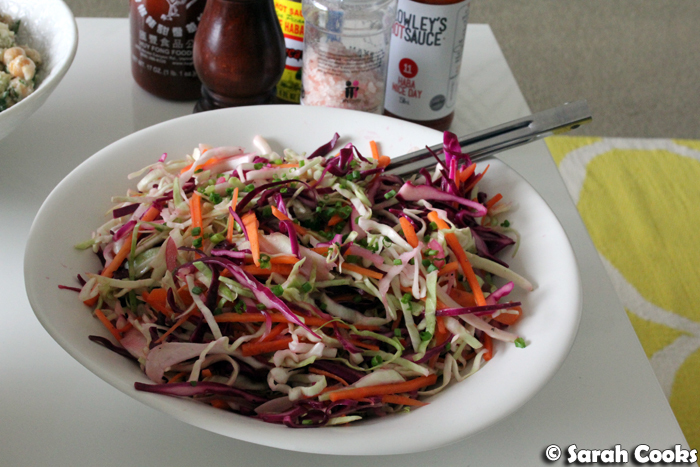 This coleslaw was an off-the-cuff mix of shredded red and savoy cabbages, carrot, and red onion, with a dressing of lime juice, chopped chilli and olive oil. I finished it with a sprinkling of chives. 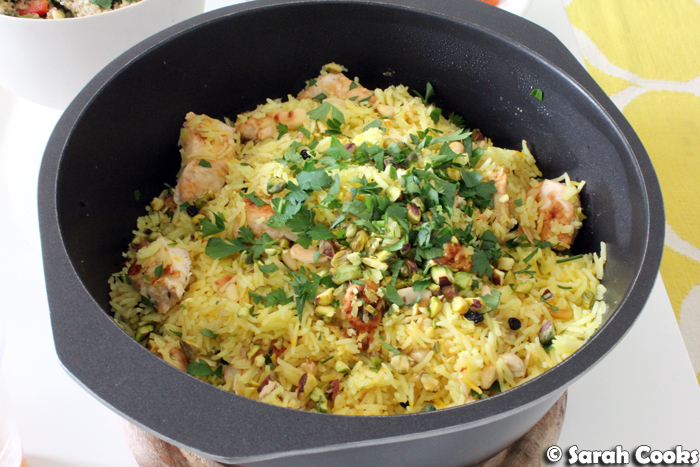 Saffron-scented chicken pilaf! This is one of my most-loved recipes, from Nigella's Forever Summer. (You can also read my first blogpost about it here). 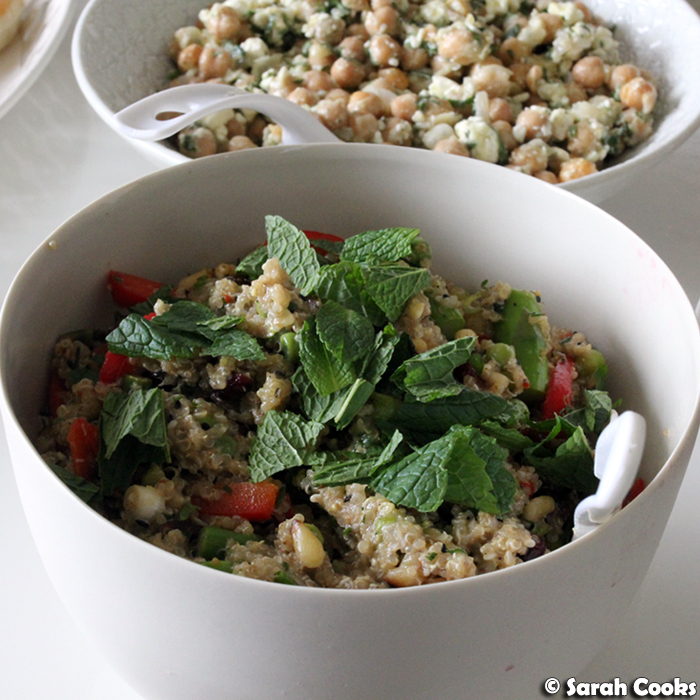 Sandra made a superfood salad - cooked quinoa with currants, toasted pine nuts and cashews, capsicum, asparagus, parsley and mint. This was delicious, hearty and healthy, and it was really popular with our friends. Yay! 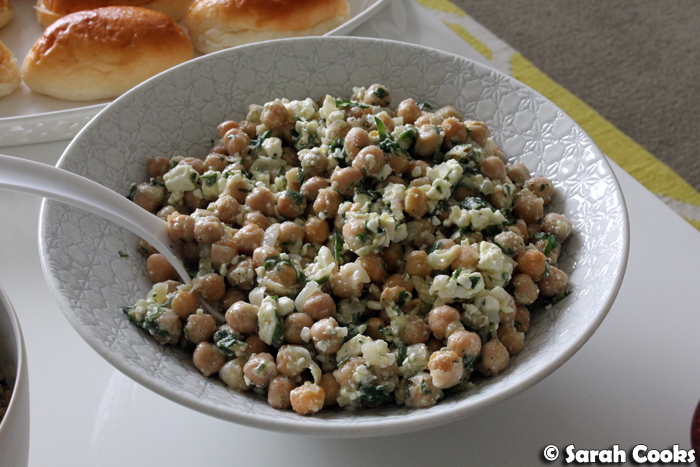 The chickpea and feta salad comes from Tessa Kiros' gorgeous book, Falling Cloudberries, and is one I regularly pull out for lunch parties and barbecues. So, those were all the savouries, but it's not really a celebration if there's no dessert! 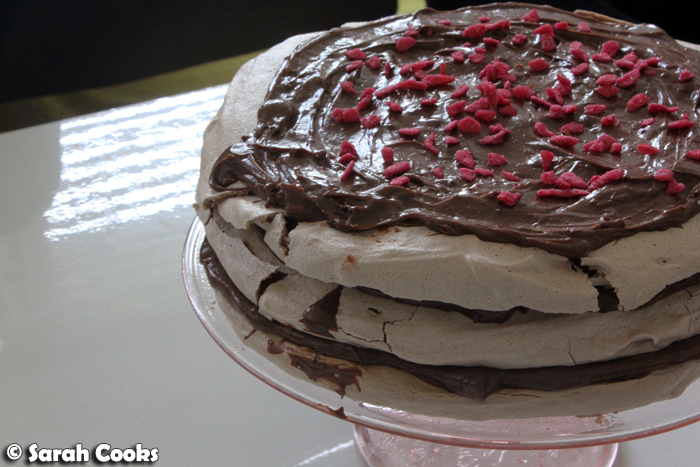 The first dessert was Nigella's magnificent Gooey Chocolate Stack - three layers of chocolate meringue, sandwiched with rich chocolate custard. 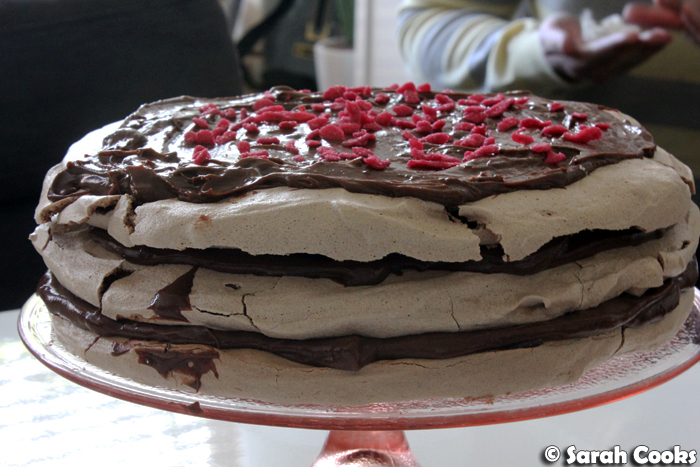 The Gooey Chocolate Stack was actually the first thing I ever blogged, so it only seemed right to whip it out for this occasion. For anyone interested, you can check out my very first post here. (Complete with poorly composed, brightly flash-lit photos from my Canon IXUS 500, oh dear). 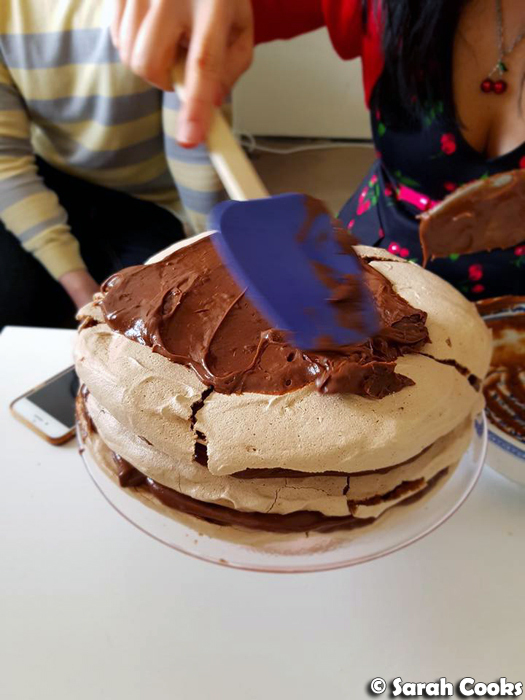 We'd run out of room in the kitchen, so after clearing up the plates from lunch, I brought the meringue layers and chocolate custard out into the lounge room and assembled the dessert there, under the watchful eyes of my friends. Despite numerous requests, sadly there just enough custard to fill the dessert, and none left over for licking the bowl. Boo! Nigella's stack is topped with jade green slivered pistachios; I decided to go a bit more showy with divine crystallised roses. (Thank-you to my friend Clarice for sending these to me!) Also, slivered pistachios are expensive, and when you chop up regular pistachios they look all dusty and yellow, rather than vibrantly green. 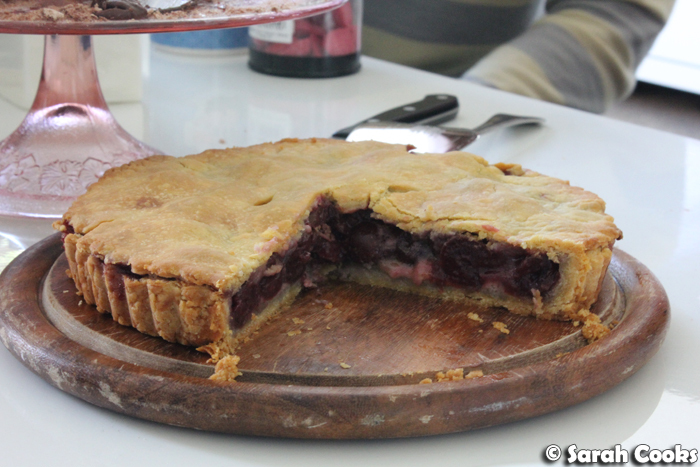 Second dessert was another favourite of mine, Nigella's cherry pie from How to Eat. I first made it during the Sarah Discovers How to Eat days, and I still love it! 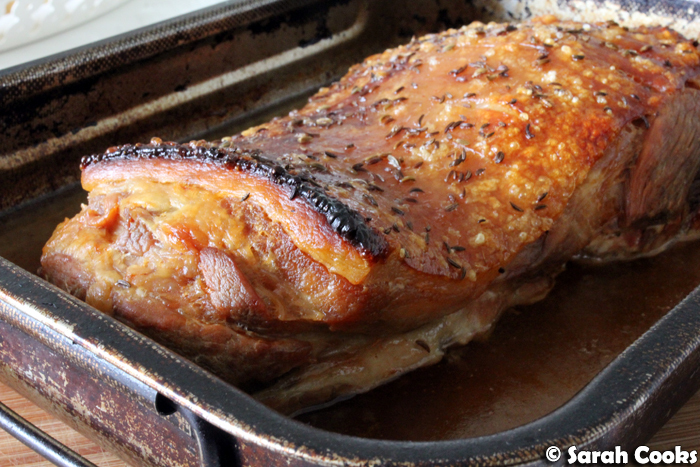 Don't be fooled by its plain appearance - it is one of the most delicious things you will ever eat! So buttery. Such cherry. 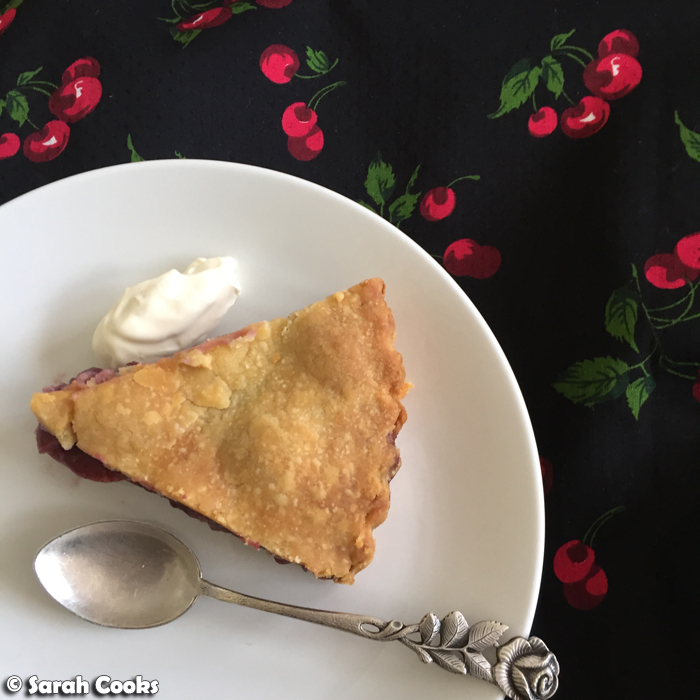 Nigella's rich shortcrust is fabulous, and is my go-to pastry for fruit pies. 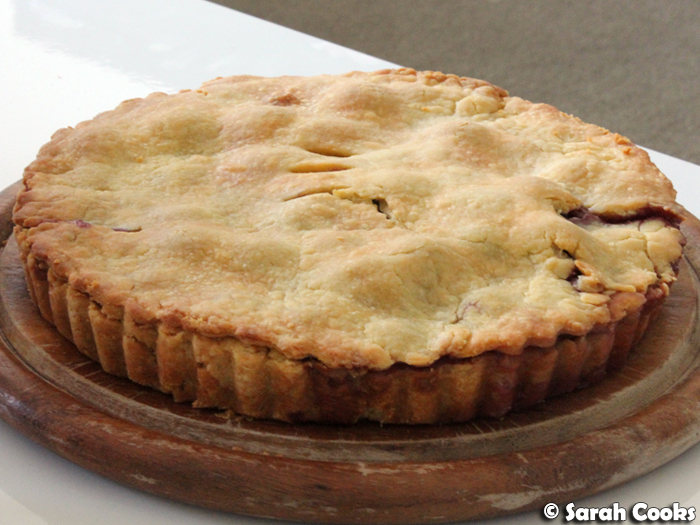 (I've also used it to make a regular apple pie, cherry and apple pie, and my ultimate apple pie). And yes, I have a dress that matches my pie. Thanks to everyone who's been reading my blog these past twelve years! Here's to many more happy and delicious moments!